Through the portal another world waits. Posted on June 14, 2014, in Arizona, Northern Arizona, Shadow Shot Sunday 2, Six-Word Saturday, Straight Out of the Camera Sunday, Wupatki National Monument and tagged Northern Arizona, portal, ruins, shadows, Wupatki National Monument. Bookmark the permalink. 24 Comments. What a GREAT post! So simple but so profound! When they’re wide (ie thick) as this one, I like to stand in them, lean on the wall & contemplate their “portal”-ness”. I love AZ! So much history. Hope you have a great journey and make it back safely from “the other world”. It looks to be a lovely place to slip into. Enjoy all. Sounds magical and mystical to me! Wow-check out that thin slab of stone that was used for the lentil! 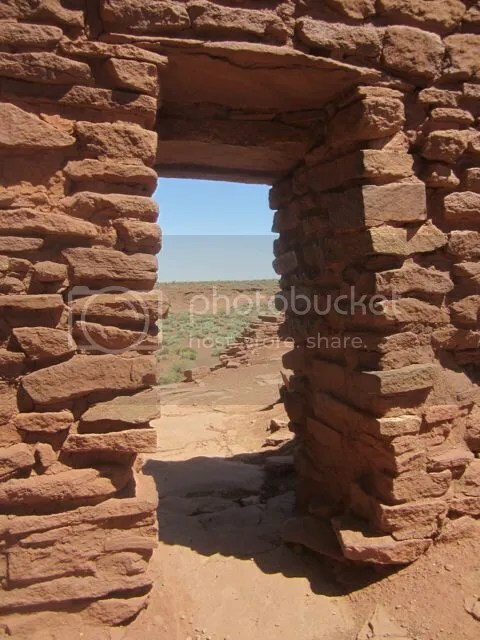 Much the same kind of building we see at Chaco Canyon, isn’t it? Beautiful combination of the photo and the words. Did you see the ‘another world’? Is it the doorway in…or does it lead us out into the wider world instead? So love the earthy tones touched by the beautiful lighting. My favourite kind of photograph, and a lovely 6 words. Just a little bit imagination and you can jump into another world……. how vast…the expansive world awaits exploration. but you may need some water. I love portals but I wish there were some trees on the other side! It does indeed look like the doorway to another world … and I want to explore that world! Love that shot – what would it be like to be hurled back in time? I like it a lot! Thanks for playing 6WS this week! The ruins blend in well with their surroundings. A little bit of shade is a welcome thing in the desert. Thanks for visiting my shadows! A great profounding moment that make me calm.